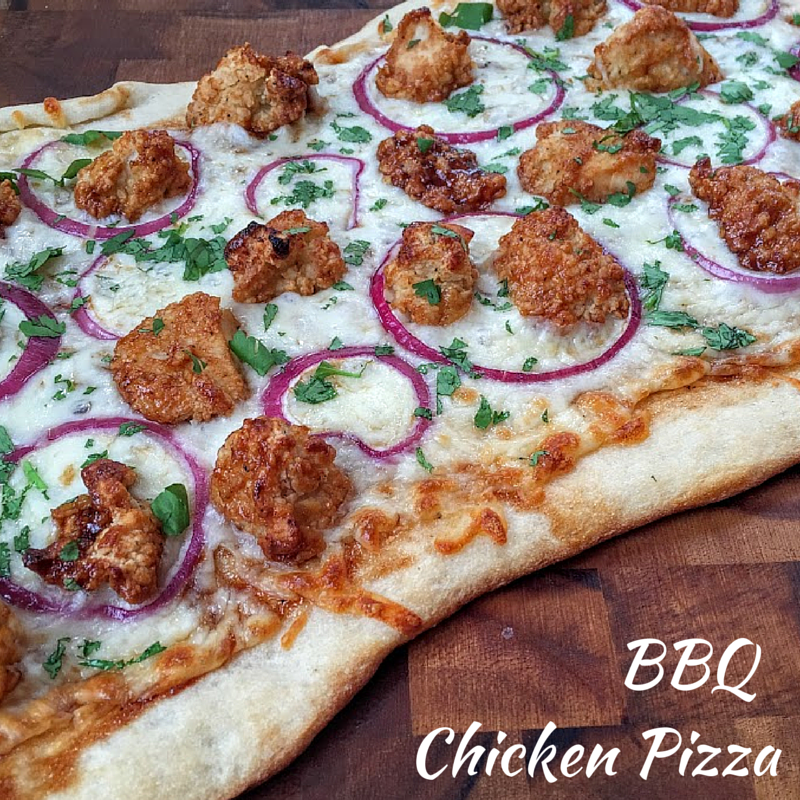 BBQ Chicken Pizza Makes Football Fun! If your house is anything like my house, every Sunday in the fall we have football on all day long. I don’t mind too much because that means party snacks! Occasionally, we’ll have a few friends over to watch games too, so I need to be prepared with quick and easy appetizer and snack options for my hungry guests. We get pretty competitive during football season when it comes to snacking at our house, and you can too! Farm Rich currently has a Back Your Snack Contest where you can help one lucky contestant win $10,000! Put on your apron, jump in the kitchen and get your creative recipes out! 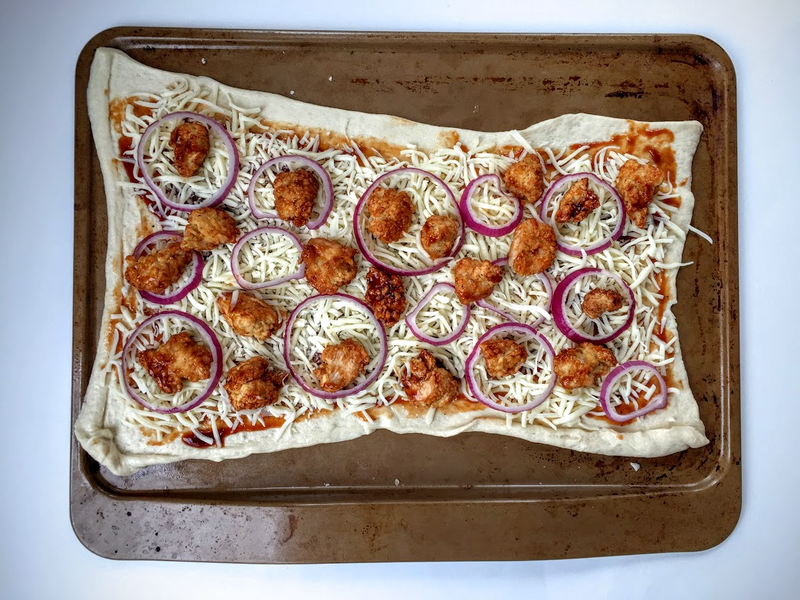 A Snack Hack I regularly make is BBQ Chicken Pizza. 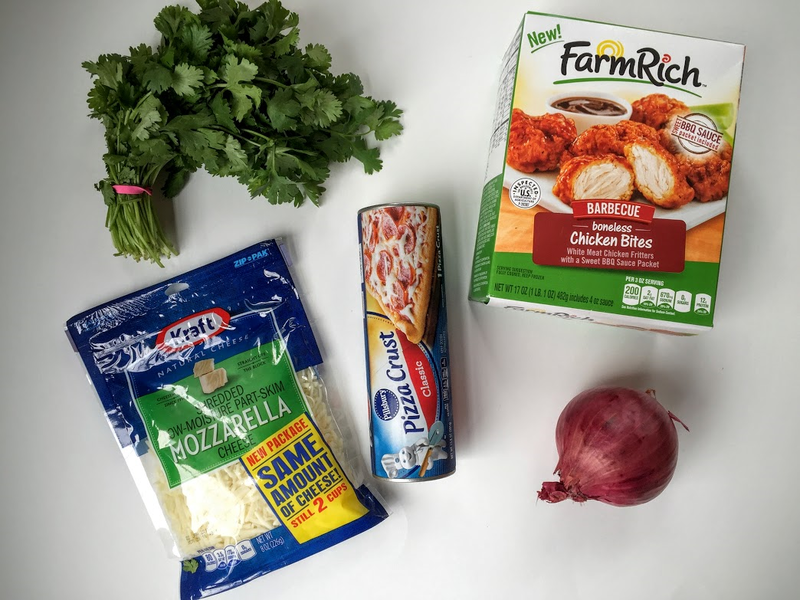 I am able to take a short cut with Farm Rich BBQ Boneless Chicken Bites and use them on my pizza. Saves so much time! 3) Pizza Dough – Fresh, Canned – whatever you’d like! Preheat the oven to 425 degrees. Bake the Farm Rich BBQ Boneless Chicken Bites as instructed on the package. Slice your red onion thin and chop your cilantro for garnish. Feel free to add as much or as little as you’d like! While those are baking, roll out your pizza dough (Don’t worry if it’s not perfect, that’s the beauty of homemade pizza! ), use half of the BBQ Sauce from the Farm Rich BBQ Boneless Chicken Bites to use as “pizza” sauce. Then sprinkle the mozzarella cheese and red onion all over. Once your Farm Rich BBQ Boneless Chicken Bites are done, remove from the oven and cut them up into smaller bite pieces, toss in the remaining BBQ Sauce and put on the pizza. Bake until the crust is cheesy and golden – about 10 minutes at 425 Degrees. Remove the pizza, garnish with cilantro and serve! You can find Farm Rich products are located in the Appetizer + Snacks Section in the freezer department at Wal-Mart. While you are there, check out the other yummy options like Mozzarella Sticks or Potato Skins to add to your game day line up. I love that I can pick up my fresh ingredients there too to give my pizza and bright and delicious look and taste. Interested in seeing some the finalists from the Farm Rich Back your Snack contest in action? You can check our a demo at any of these Wal-Mart locations on 10/8,10/9 and 10/11. All voters will also be entered into a sweepstakes and can be one of 5 winners for the voters “sweepstakes”. For all the details, check out the rule book! Now that you’re officially hungry, what Snack Hack would you make with your Farm Rich Snacks? This looks so delicious! I love BBQ pizza and this looks like a great way to quickly make it!! Looks delicious! I love shortcuts when preparing dinners and snacks! Yum! We love BBQ Chicken Pizza too! I've never thought of using something like this as a shortcut. Thanks for sharing!